When the Brightstar family leaves fog-shrouded and predictable Mira III for Cyraria, they have no idea their comfortable lifestyle is about to end forever. Even before the starcruiser arrives, shocking events transpire that comprise a parent’s worst nightmare. Not only is their fourteen-year-old daughter missing, but it’s clear her father’s ruthless and power-hungry nemesis plans to exploit the situation to promote his own selfish ambitions. Formidable and lethal challenges await as increasingly suspicious circumstances scatter them across the galaxy. Will they survive long enough to be together again? Listen with Audible, Amazon, or iTunes! What’s Creena really like? Get to know her better here! 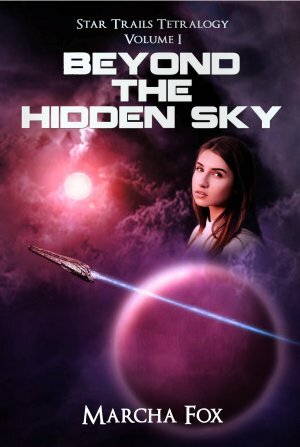 A FREE electronic version of Beyond the Hidden Sky is available on most online sales channels. Join Preferred Readers here and be notified of giveaways, contests, and other promotions. Buy directly from the author and get an autographed copy for the same price, postage included! (USA only. Send requests regarding international rates to info@kallioperisingpress.com.) Want the entire series? Check out our selection of Box Sets under the TETRALOGY SERIES TITLES tab! Is Beyond the Hidden Sky in Your Library? Print out this form to request your librarian to include Beyond the Hidden Sky in their young adult science fiction collection.